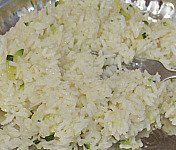 This is our favorite rice recipe. We use it as a base for so many other recipes. Adjust this recipe to your family’s size. We make everything big. Cover the bottom of your stockpot or saucepan with oil. Saute your dry rice and fresh onions in the oil until the some (about one fourth) of the rice grains turn a golden color. Note: If you’re using dried onions, don’t add them until after you add the water. They’ll burn. Add your water, zucchini, and flavoring. Stir thoroughly. Note: It's ok to put the frozen zucchini right into the rice. Just put the lid on the pan and stir it every few minutes - until frozen zucchini is thawed. Bring the rice to a boil. Put the lid on the pan and turn the heat down to low. When the rice isn't watery, it’s done.